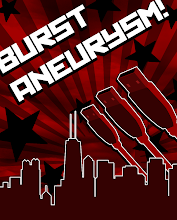 BURSTANEURYSM.COM: I should update more often. I was supposed to be off today, but my boss won't let me take a personal day until I have some of my projects completed. It's not that I'm not trying. It just seems like his idea of how to proceed is different than mine. He doesn't explain his methods, so I'm left guessing... I usually guess wrong. Last week, he told me to do one thing on a project. The other day, when I told him where I was at, he said "Uh, I'm not so sure that's how you should go about this." Amnesia can really ruin a work place. Well, beer helped me forget about that nightmare. So yea. Tomorrow, back to work. Totally going to try to hit up the Chicago Air and Water Show this weekend (hopefully, Sarah is feeling better).